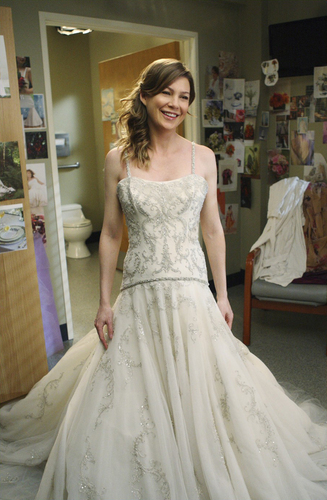 Meredith's wedding dress. . HD Wallpaper and background images in the Grey's Anatomy club tagged: meredith grey's anatomy. This Grey's Anatomy photo contains japon, jurk, bruidsjurk, trouwjurk, bruids jurk, wedding gown, wedding dress, baljurk, and bal toga. There might also be thee toga, thee jurk, toga, robe, gown, jurk, mantel, strapless, and blote schouders.